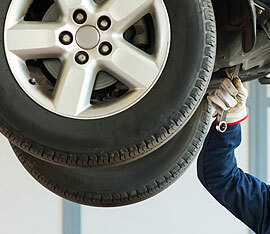 Our trained tyre fitters are on hand, ready to check that your tyres are operating safely and efficiently, and that your wheels are balanced and properly aligned. If you are concerned about your tyres or wheels, please call Buxton Car Centre Service & Repairs on: 01298 24333. Our team of tyre fitters offer professional advice and will help you choose the most suitable tyres for your car or van, and will ensure that you get the best possible price. We regularly have special offers on tyres for cars, commercial vehicles and 4x4s, and our local Price Promise means we will never be beaten on price. We monitor tyre prices at every outlet in the Buxton area to ensure our customers always get the best deal. Driving over potholes, speed bumps or kerbs can knock your wheel alignment out, causing uneven and excessive wear on your tyres, and it can also feel like your car is pulling to one side. 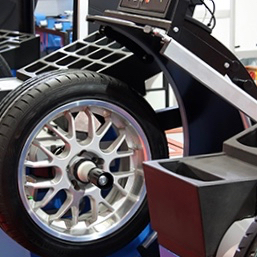 Wheel alignment or tracking is one of the most important factors in maintaining your tyres, to ensure optimum performance, even tyre wear and a maximised tyre life. Wheel alignment isn’t included in the price of new tyres, but it is highly recommended that your tracking is checked when new tyres are fitted..
Tyres that are Incorrectly balanced not only causes vibration in the steering wheel but it also causes premature tyre wear and rapid deterioration of the vehicle’s suspension. If you find that your vehicle’s steering ‘wobbles’ above a certain speed, it is likely that the wheels are not balanced properly and require immediate attention. If the wheels are not correctly balanced it is not only uncomfortable to drive and can affect the safety of your vehicle.